The AMC Four Thousand Footer Club is proud to promote and support trail maintenance in the White Mountain National Forest. If you have applied for membership in the club, a portion of your membership fee (anything over the cost of the certificate, patch, envelope, and postage) was added to a fund maintained by the Committee for the purpose of making annual donations to specific trail projects. Members have a wonderful tradition of sending monies over and above the membership fee in order to support this on-going mission. Before: Trees, knocked down by the wind, blocking a segment of Cedar Brook Trail. Each year, the Committee consults with AMC Trails concerning projects that are planned for the AMC trail crew's summer schedule--usually rock work and/or bog bridge building. Both types of construction help to stop erosion, stabilize the treadway, keep hiker's feet out of the water, and protect sensitive plant life. Without this work trails steadily widen, soil is washed away, damp areas become mud holes, and steep sections become gullies. In the past 10 years the AMC Four Thousand Footer Club, thanks to its members, has donated more than $116,000 to the AMC’s trail work. In the past 10 years the AMC Four Thousand Footer Club, thanks to its members, has donated more than $116,000 to AMC trails. 2017 Trail Donations ~$1,000 to The Waterman Fund ~ The Waterman Fund’s objective is to strengthen the human stewardship of the open summits, exposed ridge lines and alpine areas of the Northeast. $5,000 for work on the Twinway, which is a segment of the Appalachian Trail, that passes over South Twin Mountain. $5,000 for work on the heavily used Lonesome Lake Trail, used by hikers heading to the lake, and beyond to North and South Kinsman. 2016 Trail Donations ~$1,000 to The Waterman Fund ~ The Waterman Fund’s objective is to strengthen the human stewardship of the open summits, exposed ridge lines and alpine areas of the Northeast. $6,000 for much needed work on the popular Randolph Path. 2015 Trail Donations ~$1,000 to The Waterman Fund ~ The Waterman Fund’s objective is to strengthen the human stewardship of the open summits, exposed ridge lines and alpine areas of the Northeast. 2014 Trail Donations ~ Seven Projects Selected ~ The Club donated a whopping $17,500 to fund a variety of projects throughout the White Mountains. For erosion and treadway work on the Avalon Trail, the Mount Tom Spur trail, and the Willey Range Trail, the Club donated $ 7,500. An additional $5,000 was donated for a new bridge across Nineteen Mile Brook on the trail of the same name. (The former bridge was destroyed by Tropical Storm Irene. The new bridge will be built in 2015.) For a variety of improvements needed at the Guyot Campsite, $ 2,000 was donated. This campsite is a popular overnight stop for hikers crossing the Bonds. For additional work on the heavily used Falling Waters Trail, the Club donated $1,500. And, for the rugged Caps Ridge Trail, $1,500 was donated for much needed work. Thank you to all who contributed. Pictures of the work completed to date are here. 2013 Trail Donation ~ Hancock Loop Trail ~ The Club donated $4,200 this year to fund the building of bog bridges between North and South Hancock. The money covered the materials and airlift to fly 200 linear feet of bog bridge material to the ridge (outside Wilderness boundaries). Pictures here. 2013 Trail Donation ~ Wildcat Ridge Trail ~ The Club donated $6,300 to fund the building of 100 linear feet of bog bridges between Wildcat A and D, and, 200 linear feet between Zeta Pass and Middle Carter. The money covered the materials and airlift and the work was performed by the Camp Dodge volunteer crews. Pictures here. Donations to The Waterman Fund ~ Established in 2000 in memory of Guy Waterman, The Waterman Fund's objective is to strengthen the human stewardship of the open summits, exposed ridges, and alpine areas of the Northeast. The fund awards grants to non-profit organizations and governmental agencies responsible for these areas. To date, the Club has donated $7,000 to the Waterman Fund. To learn more visit www.watermanfund.org. In addition to the need for financial donations, there is the need for labor. Many opportunities exist for individuals to volunteer their time performing basic trail maintenance (clearing water bars, brushing back encroaching limbs, removing small fallen trees, etc.) Several members of the Committee are trail adopters, and the Committee as a whole is the adopter for the Passaconaway Cutoff, part of the route to Mt. Passaconaway. Please see the resources below for your opportunity to give back. No experience is needed, and each organization provides training. Discover just how fun trail work can be! Appalachian Mountain Club offers an Adopt-a-Trail program, as well opportunities to volunteer for a weekend, or a week, on trail projects. Visit the AMC website at www.outdoors.org. Click on the Volunteer tab, then on the Trail Volunteers link. 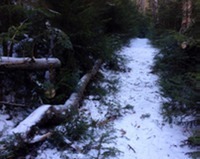 For information on the Adopt-a-Trail program, contact Colleen Mainville at 603-536-6243. 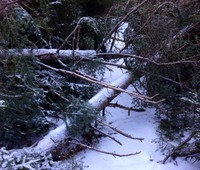 After: Fallen trees sawed through and dragged off Cedar Brook Trail. For a listing of trail work organizations around the state, click here.